Traditional Windows, Mac, and Linux systems within your LAN need essential security to block advanced malware, control data loss and compliance risks caused by removable media, and provide safe access to critical email and web applications. McAfee Endpoint Protection Suite integrates these core functions into a single, manageable, multiplatform environment ideal for safeguarding traditional desktops that have limited exposure to Internet threats. Real-time anti-malware and antivirus protection — Block viruses, Trojans, worms, adware, spyware, and other potentially unwanted programs that steal confidential data and sabotage user productivity. Proactive email and web security — Intercept malware and spam before it reaches inboxes. Built-in McAfee SiteAdvisor Enterprise Plus warns users about malicious websites before they click and allows administrators to authorize or block website access, ensuring compliance. Traditional desktops and fixed systems within your LAN probably have layers of gateway or network security to protect them. Yet they still need essential security to block advanced malware, control data loss and compliance risks caused by removable media, and provide safe access to critical email and web applications. The McAfee® Endpoint Protection Suite integrates these core functions into a single, manageable environment ideal for safeguarding traditional desktops and other systems that have limited exposure to Internet threats. What do call centers, engineering design studios, and doctors’ offices have in common? Their users rely on tower-based PCs and traditional desktop systems that never leave the office. Since these systems don’t visit wireless hot spots, help kids browse the Internet at night, or get left at airports, they have a lower risk of being hacked, picking up malicious downloads, or being stolen while carrying sensitive data. However, corporate users rely heavily on webenabled applications and email, so even these fixed machines require sophisticated protection against the targeted, real-time malware these applications convey. Your email server should have an extra dose of anti-malware, backed up by malware protection on each endpoint itself. In addition, most modern PCs have multiple USB ports and DVD drives. In the case of call centers, engineering design studios, and doctors’ offices, an unhappy worker might take home customer databases, engineering designs and other intellectual property, or patient records and financial data. Device controls can help you restrict use of removable media and portable storage to avoid these data losses. The McAfee Endpoint Protection Suite seamlessly integrates proven security to help you manage all of these risks, delivering both operational efficiencies and cost savings with the convenience of a single solution. Consolidate endpoint and data security efforts with an integrated endpoint security solution from one vendor — securing stronger protection at a lower cost. McAfee enables you to manage endpoint security from one centralized console and connect to other McAfee and third-party products, improving visibility and expediting response times. Enable increased protection without delay. The EASI installer gets your strong protection running in as few as four clicks. Endpoint Protection Suite is integrated with the McAfee ePolicy Orchestrator (ePO) platform so you can deploy and manage security using a single environment. With the unprecedented growth of advanced persistent threats, enterprises cannot depend on solutions that use only signature analysis for endpoint protection. There is a gap of 24 to 72 hours from the time a threat is identified to the moment its signature is applied to endpoints. In the meantime, your data and systems are exposed. McAfee Global Threat Intelligence™ file reputation closes this gap, providing real-time, always-on protection based on the multi-vector threat insight gathered by McAfee Labs. It quarantines or blocks viruses, Trojans, worms, adware, spyware, and other potentially unwanted programs that steal confidential data and sabotage user productivity. Our solution scans your inbound and outbound emails to intercept spam, inappropriate content, and harmful viruses. We can quarantine suspicious emails to prevent evolving email threats from affecting your network and users. And a layer of antivirus protection for your email server prevents malware from reaching user inboxes. We make it possible to prevent critical data from leaving your company through removable media, such as USB drives, iPods, Bluetooth devices, recordable CDs, and DVDs. Tools help you monitor and control data transfers from all desktops, even if a device is physically disconnected from the corporate network. Control desktop applications that can access the network to stop network-borne attacks and downtime. You can deploy and manage firewall policies based on location to deliver complete protection and compliance with regulatory rules. Many web threats are silent and invisible to web surfers. Help ensure compliance and reduce risk from web surfing by warning users about malicious websites before they visit. You can also authorize and block website access based on users and groups, controlling user access to sensitive or inappropriate sites, such as gaming or adult content. All of the capabilities of the McAfee® Endpoint Protection Suite are managed by McAfee ePolicy Orchestrator® (McAfee ePO™) software, a centralized platform that manages security, enforces protection, and lowers the cost of security operations. Web-based for easy access, it provides intelligent security for quick and effective decisions and greater control. McAfee ePO software can reduce the cost of managing IT security and compliance by more than 60 percent (Source: MSI International survey of 488 mid-sized and large enterprises). This open management framework takes advantage of a single agent and single console design. Compared to old-style point solutions, our streamlined approach dramatically simplifies installation and maintenance of defenses and their associated rules and policies. It eliminates the system impact of multiple agents and the decision inefficiencies of multiple consoles. When policies need to be revised, updates happen quickly, accurately, and consistently. You can correlate threats, attacks, and events from endpoint, network, and data security as well as compliance audits to improve the relevance and efficiency of security efforts and compliance reports. No other vendor can claim a single integrated management platform across all these security domains. 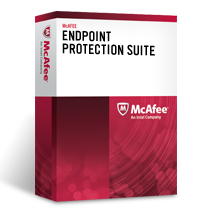 Download the McAfee Endpoint Protection Suite Datasheet (PDF).